Spring is here in the northern hemisphere and, for home outdoor growers, it’s time to pop those seeds and get this year’s first grow started. Fresh seeds sprout best. Although seeds may still be able to germinate after many years of dry storage, fresh seeds from last years crop or from a reputable seed bank will have a higher germination rate and create more vigorous seedlings. How about those seeds you found in the bottom of an old bag of grass in your sock drawer? If this is your first grow, you might rather pick out an inexpensive feminized variety (such as the great WSS Skunk strain) to improve your chances of sprouting healthy female plants. 2) Soak seeds overnight in warm water. The hard outer shell of the cannabis seed requires some to to allow water in and give the seed the “wake-up call” to begin sprouting. Drop your seed(s) in a glass of warm water and let them soak for 12-18 hours. Never use hot water (above 100F/38C), as this can kill seeds. Use only a non-fertilized sprouting substrate (soil). 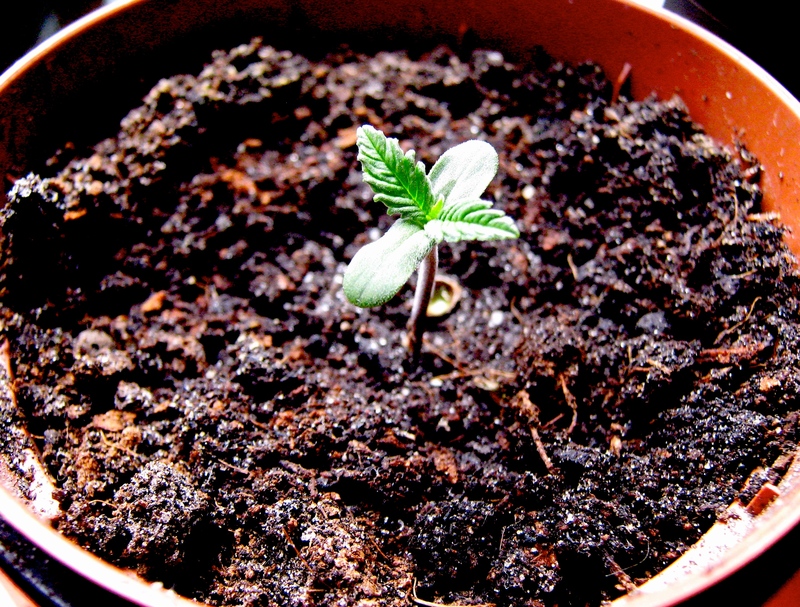 The roots of seedling plants are far more sensitive to over-fertilizing than adult plants, and marijuana fertilization is already a delicate task. I am not a fan of starting seeds in rockwool or fiberglass cubes, as this requires more handling of the seedlings. Instead, use basic non-fertilized potting soil. Place the soaked seed on the surface of the soil and sprinkle just a pinch of damp soil on top. Do not bury seeds in the soil. Sprout seeds in a warm location. Beyond moisture, the seeds require warmth to sprout. The natural way is best – allow sunlight to gently warm the soil by placing the potting container on a sunny windowsill. Natural sunlight will suffice for sprouting – you don’t need to set up artificial lighting yet. Keep soil moist but not wet. Mature cannabis plants don’t like wet roots, but seedlings do best when the developing roots are not allowed to dry out. If the surface of the soil becomes dry to the touch, moisten it with room-temperature water. Since we work with a lot of naturally composted soil, we sometimes have a problem with fungus gnats, and this is the only time we’ll reach for a pyrethrin spray to nip the problem in the bud. The smallest possible puff of a pyrethrin insecticide will stop these rather sensitive pests. You should be aiming for the top of the soil – not the seedling itself. 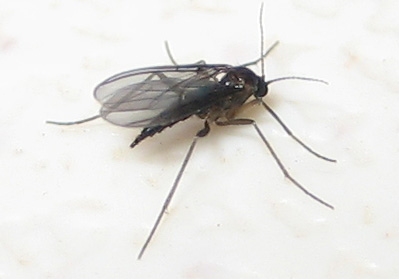 The fungus gnats want to lay eggs in the soil, not on the plant. We want to keep them off the soil so their larvae won’t eat your poor seedling’s roots from below the soil. Don’t handle seedlings. Although it may be tempting to pick a seed husk off of the first developing leaves, or try to encourage a tilted seedling to grow straight with some kind of support, just let them be. A strong seeding will right itself and needs no human help to get a start. In fact, if it turns out to be a stunted or week seedling, it’s best if you let it falter on it’s own and start a new seedling, rather than raise a weak and low-yielding plant all the way to harvest!